What the hell, right? I just did an X-Book last week! Where has the variety gone? Well, as of this writing (and I say the a lot knowing I’m writing batches of these at a time without really keeping track of when they will be posted), this has been the week from hell. Most notably, my cat died out of nowhere from a heart…thing (wait, do you care about my personal life? Boy I hope so, so hold on for a paragraph or so, chum), we paid $1000 in tests to see if his [literal] brother has the same heart condition he apparently had (“fun” fact: between writing and publishing this, his brother ALSO died because he developed bladder cancer), my hot water heater sprung a leak, and the computer on which I have most of my comics stored stopped working (Uh, because I dropped it walking upstairs, like a schmuck). So I’ve not really had the time or energy to get into much reading, and I have not had the time to look into getting my comics retrieved and placed onto an external hard drive or something. So I’m dipping into the book I was last reading just for funsies before all this started. Also, it’s my birthday week. So… yay? Writer and Artist: Chris Claremont, Louise Simonson, Jim Lee, Rib Liefeld, Jon Bogdanove, and others. Antagonists: Cameron Hodge and everyone who wants to Make Genosha Great Again. So I’d been wanting to re-read this for years after buying the X-Cutioner’s Song collection some time back. I had a fondness in my youth for both of these crossovers when I was young (the first Uncanny X-Men book I remember buying as a kid was Uncanny X-Men#258, and this started twelve issues later, so it was very early into my fandom), but coming back to X-Cutioner’s Song was a touch disappointing. I was dreading to find out if this book held up where the other didn’t quite. Turns out, it’s… all right. I don’t usually talk about art right to start, but I will here because it is all over the friggin’ place since it is a crossover from three different titles. To start with, you have some classic Jim Lee art on the Uncanny X-Men side of things. That’s pretty self-explanatory; the guy has had a hell of a career, and this was his heyday where he made his name one of the biggest in the industry. On the New Mutants issues, you’ve got Rob Liefeld, who is pretty much a punchline in comics for the past 20 years, but this was back when he was becoming a famous commodity, as well. And while this early work of his doesn’t have anywhere near the silly excessive lines and disproportionate shapes Rob is known for, it’s also somehow less polished and solid than most of his work. John Bogdanove rounds out the trio as the least well-known of the X-Tinction Agenda’s art team, and his work is, frankly, not that great. It’s sloppy and cartoonish, and… I don’t know. I don’t mean to yuck your yum if you’re into his art, but it’s really not for me. This brings me to the first problem I have with the Agenda… as I thumb through it, my eyes are perpetually drawn to about 33% of the story, while the rest doesn’t pull me in nearly as effectively. 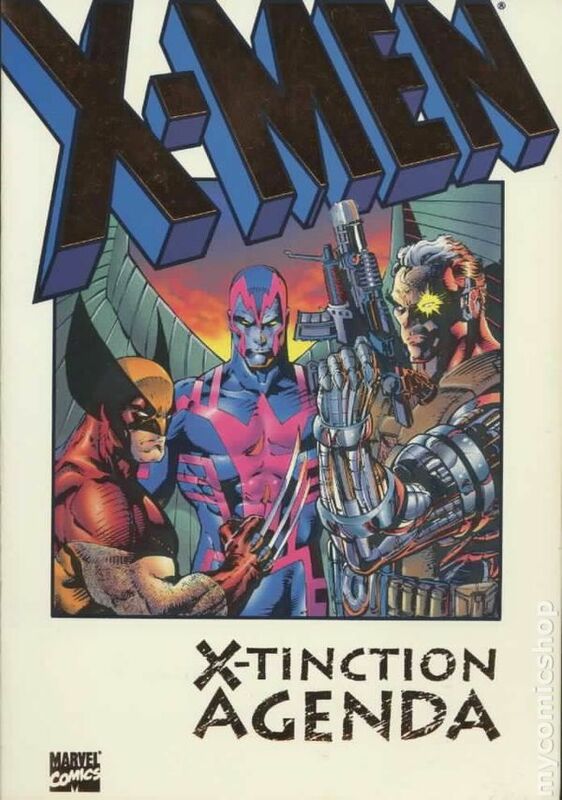 Everyone knows the X-Men as a story of folks who are different, doing their best to live, strive, and even be heroes in a world of people who hate and fear them, and X-Tinction Agenda is one of the pre-eminent stories of that theme. The nation of Genosha is thriving because they use their mutant population as slave labor, and after an early confrontation with the X-Men (which is conveniently included in the trade version of the story as a precursor to get you up-to-date), they have set their sights on the mutant team to be brought back by force for a trial. This results in an all-out assault on mutant hero teams with the future of a nation at stake. X-Factor, the New Mutants, and the scattered X-Men all converge (some willingly, others less so) on the country, and the future of mutant kind is fought over. Like I said, as an X-crossover, I do think this holds up better than, say, X-Cutioner’s Song, and maybe those two are always linked in my head just because of their egregious disdain for the letter E. But with Song feeling a bit over-the-top and crowded with characters and villains, Agenda flows much more smoothly and is substantially less convoluted, even as X-characters are coming from all over the place to reunite in the wake of the Siege Perilous’ displacement of them. Also of note, the Genoshans as a people are handled well enough here. While the people of the country generally approve of what their leadership is doing, there are many layers of conflict to be found amongst them. Some are fine with their economy, but hate the tortuous methods of Hodge. Others see the entire system as abhorrent and are sympathetic to the plight of mutants. 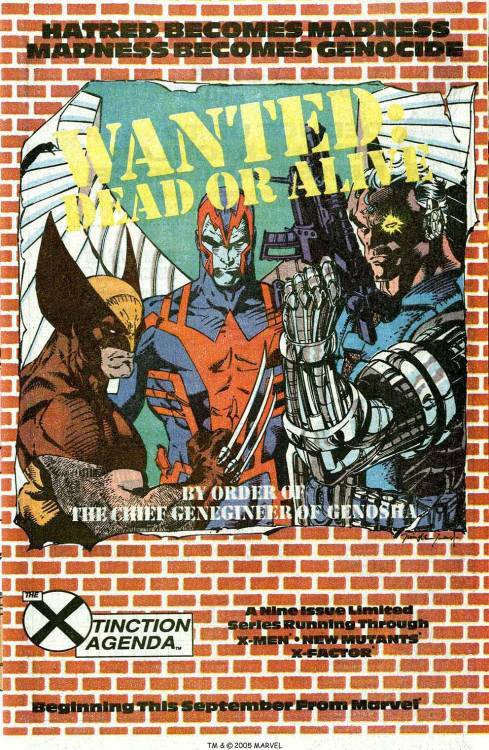 It would have been easy to paint the entire country with the broad stroke of being the enemy—and to be fair, the vast majority of the country are on board with enslaving mutants, sometimes to the point of comical maliciousness—but there is just enough depth of character added in the nine issue crossover to make Genosha feel alive. It’s too bad Cameron Hodge did not emerge from X-Tinction Agenda with a larger role in the X-Universe going forward because he is a hellacious baddie here. Literally immortal (if only his disembodied head), and attached to a robotic body that can emulate several different mutant powers, he is a force to be reckoned with for the combined might of three X-teams. They ultimately defeat him by once again decapitating him and then burying the head under a collapsed skyscraper. And from there, I think Hodge only makes one more appearance, during the Phalanx saga, and that’s been it for him as far as I can recall. I feel like he should have become a perpetual thorn in mutant kind’s side, but… not so much. Talking Point: Now I’m kind of stuck on the whole Cameron Hidge angle, so today’s Point is: what other comic villain do you think has been underutilized? Who maybe came in like a ball of fire, but then fizzled either (either because they were prematurely killed or were never handled particularly well again)? Remembering the big X-crossovers of my youth, this was… one of the better ones. Certainly better than X-Cutioner’s Song, Phalanx saga, and Onslaught, maybe on an even tier with Mutant Massacre or Fall of the Mutants. The uneven art is really obnoxious as you read through it, but the threat is powerful, and Hodge is monstrous.